Nuers are happy to see Machar, a Nuer, joining the government, but envious seeing other Nuers join the government. They praise Machar’s mistakes but condemn excellences of other Nuers because they believe that something is good only when it comes from Machar. I am deeply concerned of the mindset of my tribesmen! The objective of Nuers is to revenge the massacre of Nuers in Juba not to overthrow Kiir. A revenge attack is not a political objective! What next when the revenge mission is completed? Contrary to the objective of the broad masses, Machar’s objective is a power sharing. Having two objectives in one movement means SPLM-OP has no mission. If Nuers desire honor, they have to either transform Machar or replace him. Otherwise, the journey is going to be weary and long. Because Machar, like the Pharisees, stood at the entrance, he neither does the work nor allows others to do the task for the nation. August 17, 2015 (SSB) — The Democratic Revolutionary Alliance Forces of South Sudan (DRA) have officially joined the Government of the Republic of South Sudan. Nuer supporters of Dr. Riek Machar, the leader of the Sudan People’s Liberation Movement-In-Opposition (SPLM-OP), deplore this shift and describe it as an alliance with the Dinkas. I am introducing realism in answering this question. The purpose of this piece of writing is not to convince Nuers of Machar’s mistakes because they never admit that Machar commits errors. I am writing for the sake of history because, in the end, words and actions of all will sit in the judgment seat of history, and it is the history that will convince them of the faults of Machar. Movement (SSIM), United Democratic Salvation Front (UDSF) and Sudan People’s Democratic Front (SPDF), and as the Deputy Chairman of Sudan People’s Liberation Movement (SPLM). Also, his downfall as the leader of the SPLM-OP is imminent. Whenever he fails, Machar always blames others. For instance, when he signed the Khartoum Peace Agreement with President Omar Al-Bashir, he was appointed President of the Southern Sudan Coordination Council, and given the whole budget of Southern Sudan. He left that position without purchasing a single battle tank, and afterwards blamed President Bashir for lack of ammunitions. Those who haven’t learnt Machar miss a crucial lesson in their political life. If it wasn’t due to Machar’s miscalculations, South Sudan wouldn’t be at war today. Many strategists advised him not to challenge President Kiir if he wasn’t prepared for a war. Ignoring such advice means Machar was ready for the war or didn’t understand the magnitude of his thoughts. How Machar sabotaged President Kiir’s leadership was the cause of the current civil war. When he was the Vice-President, Machar overlooked Nuers to an extent that they were like sub-humans to him. He sought Nuers when removed from the presidency. Despite disappointments, many Nuers, myself included, swallowed their resentments against Machar because the time required us to bury our differences. For this reason, various non-SPLM forces joined SPLM-OP hoping that this time Machar would learn from the history of his failures. However, Machar commenced committing grave mistakes from January 2014, one month into the war, and didn’t refrain from committing such errors to this very day. This is why I was the first officer to quit Machar’s camp in February 2014, two months into the war. I realised that Machar will never be politically “born again”. Despite that, I still valued the unity of the fighting forces under Machar hoping again that the man would re-examine himself. While others were building the “Temple” of the SPLM-OP, Machar has been busy destroying the “Temple” where he would be worshiped. Machar’s leadership model is weird in global governance. The DRA was formed prior to the current civil war. It was not out of the ruins of the SPLM-OP. Like other movements, DRA tried to ally with the SPLM-OP but Machar used the empathy of DRA members to lure Dr Simon Thor Kuon, the leader of DRA. He arrested Thor along with other DRA officers in Pagak. All his belongings, including underwear were looted. He was in jail naked. Machar was phobic that Thor may overthrow him. Was it a time for power struggle? You can see how Machar loves to destroy his “kingship”. Wouldn’t it be wise to “seek first the kingdom”? Before his arrest, Thor was invited to a night meeting organised by Gajaak officers and politicians. He refused to attend because he was suspicious. The night meeting was organised to make Thor’s assassination easier and mysterious. If murdered, the issue would have been a Gajaak affair as Machar would easily distances himself from the crime. As we found, the nominated assassins were not Gajaak. Would this be expected from Machar, the man Nuers entitle as the “Messiah” of South Sudan? After 35 days in detention, we decided to conduct a covert operation to rescue Dr Thor from detention when we have received a credible intelligence that he would be murdered in jail. The rescue mission was conducted without a single shot being fired. The Machar’s army didn’t know about the operation till they found the jail empty in the morning. The rescuing force would have conducted a surgical assault, but we didn’t want Machar’s plan of putting enmity between Gajaak succeed. From that time DRA left Machar and his followers to fight the government alone. Now, ridiculously, the same Machar’s Nuers that rejected DRA-SPLM-OP alliance are condemning DRA for joining the government. Do these people really listen to their minds? They neither want DRA-SPLM-OP alliance nor DRA-Government alliance. What do they want? They are wrong, VERY WRONG, if they think that we can return to homes at the time when the future of the country is being decided! Machar wanted to be alone, we left him alone. Nuers acknowledge the incompetence of Machar, yet, they argue that he could lead the rebellion. The same thinkers also argue that Machar has to lead because the current war is not about him. What a confusion! Why would an incompetent leads competent? If this war is not about Machar, why is he commanding a war which has nothing to do with him? Machar is the causative of the current war. If he worked with President Kiir as a team South Sudan wouldn’t be at war now. But Machar was restless because he thought he was ageing. I have a question to those who call the DRA-Government alliance as a pact with the Dinkas. If Machar and the government would sign a peace agreement tomorrow, would he be joining the Dinkas or government? If signing a peace deal with the government is a submission to the Dinkas, why does Machar wants to be the Vice-President of Salva Kiir (a Dinka) and none of his Nuers supporters deplore him? How many Dinka leaders are around Machar? Why Machar’s Nuers live with the Dinkas and are uncomfortable seeing other Nuers live with the Dinkas in Juba? Nuers are happy to see Machar, a Nuer, joining the government, but envious seeing other Nuers join the government. They praise Machar’s mistakes, but condemn excellences of other Nuers because they believe that something is good only when it comes from Machar. I am deeply concerned of the mind-set of my tribesmen! 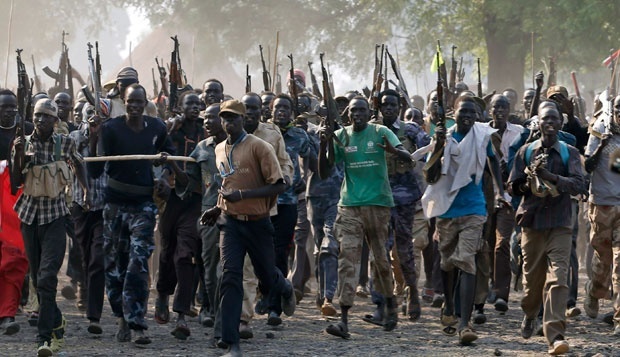 The objective of Nuers is to revenge the massacre of Nuers in Juba not to overthrow Kiir. A revenge attack is not a political objective! What next when the revenge mission is completed? Contrary to the objective of the broad masses, Machar’s objective is a power sharing. Having two objectives in one movement means SPLM-OP has no mission. If Nuers desire honour, they have to either transform Machar or replace him. Otherwise, the journey is going to be weary and long. Because Machar, like the Pharisees stood at the entrance, he neither does the work nor allows others to do the task for the nation. In summary, DRA didn’t reject SPLM-OP alliance from the commencement of the war. It was Machar who rejected the alliance thinking that he would be overthrown by Thor. There is no need to weep against DRA now. It is up to the Nuers in SPLM-OP to caution Machar as the political terrain ahead of him is going to be the most difficult one in the history of his warfare. I wish Machar a speedy recovery!